While there are many future scenarios, the focus here is on four: current, partial survive, partial thrive and full thrive. 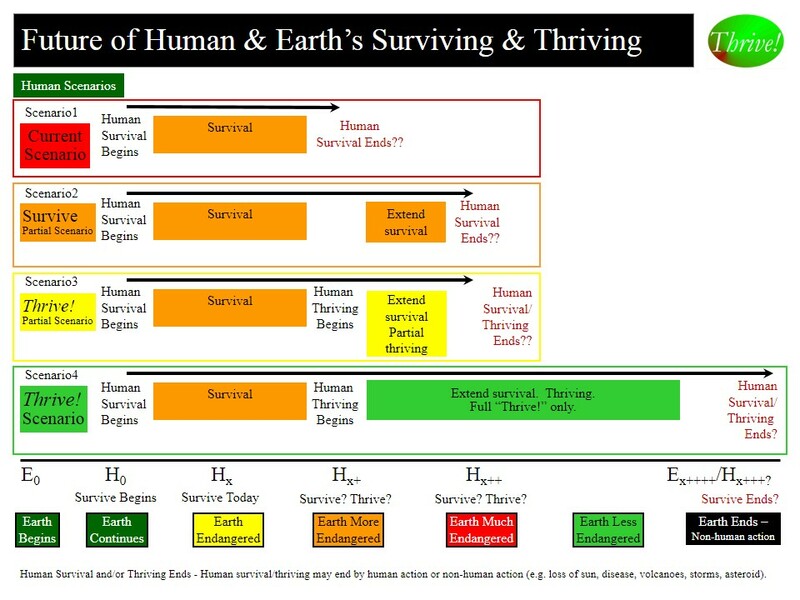 [See figure, “Alternative Futures for Human and Earth’s Surviving and Thriving”.] “Full Thrive Scenario” best fits our needs and wants but is the most challenging to achieve. Full Thrive Scenario – We change to a “full thrive” path. As a result, 1) thriving is high and 2) surviving and thriving are extended substantially beyond current path and may continue at least as long as a habitable Earth lasts. All will be performing well, well-off (financially), well nourished, well housed, well protected (exposures, crime), well educated, physically and mentally well (people), growing/developing well, living within good habitat, physically well (Earth, plants, animals, environment), not vulnerable, producing personal and public goods, living within a stable, positive climate, and sustained. For the Full Thrive Scenario, all of us together must energize and empower people to build a thriving future for all. All of us together is necessary due to 1) the scope (all), 2) the level (surviving and thriving), and 3) the duration (forever).